On this page are distributions of XPL0 that run under DOS and early versions of Windows, up to 32-bit Windows 7. Recent, 64-bit versions of Windows must use something like DOSBox to run the programs on this page. A fully Windows-compatible distribution of XPL0, called EXPL, is available here: fountainware.com/EXPL/index.htm. Distributions of XPL0 for the Raspberry Pi are available here. XPL0 is essentially a cross between Pascal and C. It looks somewhat like Pascal but works more like C. It was originally created in 1976 by Peter J. R. Boyle, who designed it to run on a 6502 microprocessor as an alternative to BASIC. The story surrounding its early history is here. Here is an example of a complete XPL0 program. It displays the (moving) image at the right, and runs on any 32-bit PC (such as a Pentium) under DOS or WinXP. If you're running under Vista or Win7, or Linux or MacOS X, you'll need something like DOSBox. More examples of simple XPL0 programs are here. If you like demo programs, Hugi Magazine has a couple articles showing how to make them with XPL0. XPL0 is available under the terms of the Free Software Foundation's General Public License, Version 2. All downloads from this site include source code (are open-source) and are completely FREE! 11-Jul-2017: Version 2.1 of XPL0 for the Raspberry Pi can be downloaded from this page. Also new is a manual for the RPi version. 27-Sep-2016: Thanks to Ed at http://dxforth.netbay.com.au/ an old version of XPL0 has been resurrected that runs under CP/M on an 8080 processor. Not all the features described in the XPL0 IBM-PC manual are available in this CP/M version. In particular 'include', floating-point, graphics, and intrinsics relating to the IBM-PC are not implemented. Some intrinsic numbers are also different. However, many modern features have been added that make this a viable version 1.2. Download XPLCPM12.ZIP (229k, 27-Sep-2016). Version 1.2 solves an incompatibility with the CP/M emulator's method of handling file names. 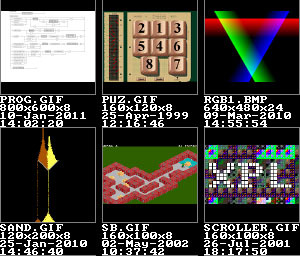 Here is the emulator: CPMEXE12.ZIP (136k, 27-Sep-2016). The double backslash "\\" comments out everything on the rest of line regardless of any backslashes it might contain. This is handy for commenting out sections of code. When a program starts, any characters entered on the command line after the program name are copied into device 8's buffer. This provides a convenient way to pass information to a program, such as file names or numeric values. The at-sign (@) is an alternative "addr" operator that works better when returning reals from a procedure that uses the call-by-reference technique. It works exactly the same as "addr" when used on an integer variable, but it returns a real pointer when used on a real variable. Note that "addr" and @ also work on subscripted variables. The "string 0" option for zero-terminated strings is now available in all versions. The Text intrinsic works no matter which termination is used. 5-Mar-2012: Although this device can be used to draw ellipses and is called a "Trammel of Archimedes," it's more commonly known as a "BS Grinder." With the program you can view it from any angle while it grinds away. The Lattice program is a version of M.C.Escher's Cubic Space Division. It consists of 5,324 blocks which are drawn as 31,944 triangles. My Athlon 2400 updates the screen ten times per second without hardware acceleration. These programs use the Z-buffer rendering technique, which solves the visible surface problem for objects of any shape. It also provides X-ray vision! 9-Jan-2012: This program understands English commands such as "Put the red block on top of the green one." It was inspired by a much more sophisticated program called SHRDLU. Download BLKWORLD.ZIP (22k, 9-Jan-2012). This will tell you how late it is while saving you lots of money on Nixie tubes. Download NIXIECLK.ZIP (53k, 28-Jun-2011). 26-Jul-2011: Some long-neglected maintenance has been done, such as fixing broken links and re-linking programs that didn't run under DOSBox ("packed file corrupt" - thanks Rugxulo!). There are new versions for Matey, See, and DPR. One of the things I have to admit I like about Windows XP is its ability to display thumbnails of all the images in a folder. Now you can do the same thing under DOS - at least for these file formats: BMP, GIF, LBM, IFF and PCX. Meticulously commented source code is provided so you can add the formats you want. Download THUMBS.ZIP (34k, 26-Jul-2011). XPL0 is similar to Pascal and C. Although not mainstream, over the years it has proven to be immensely useful. It has been used to write everything from operating systems for 6502- and 68000-based computers, to commercial programs for 8088-based (PC) computers, to embedded firmware for PIC and other microcontrollers. Since its inception on the 6502, it has been steadily upgraded and spread to other processors such as 8080, 6800, PDP-10, IBM-360, a couple homebrew machines, 65802, 680x0, PIC, Ubicom, and, most notably, the 80x86 family used by IBM-compatible PCs. If you're hooked on C, XPL0 might not appeal to you. It doesn't have all the features of other languages. Normally this is not a problem, and it makes the language easier to learn. XPL0 is by no means crippled. It's a block-structured language that supports recursion. It has two data types: integer and double-precision floating point ('reals' - with and without a math coprocessor). Even the small 16-bit version allows both code and data spaces larger than 64K. It provides generalized device I/O for the console, printers, files, and serial ports. It allows unlimited-dimensional arrays and complex data structures using pointers. It allows up to 8 levels of procedure and function nesting (compare this to C which only has 2). It has conditional compile, include files, separately compiled modules, inline assembly code, built-in graphic and transcendental routines, peek, poke, and port I/O. The intent of this webpage is not to persuade you to use XPL0, but merely to make the language available. XPL0 is a significant piece of work that continues to be useful despite massive support behind other languages. If you're new to programming, you may find XPL0 easier to learn than the myriad of languages called "Basic." If your interest in programming is to make money, you're probably better off with Delphi or Visual C++. The versions of XPL0 offered on this website do not support Windows applications, which are expected on today's PCs. However, if you think programming is fun and want a deep understanding of how programs and compilers work, XPL0 may be for you. These examples will give you a quick idea of what XPL0 is like. If you're familiar with C, Pascal or FreeBASIC; you might find this chart helpful to see how XPL0 compares. The native and optimizing compilers require an assembler such as MASM or TASM. A free version of MASM can be downloaded from here: http://www.aurskogcity.8m.com/compilers/compilers.html. Version 5.10 is sufficient and recommended. The optimizing compiler generates code that is about twice as fast and half the size as the non-optimizing native compiler. This shows how the Sieve of Eratosthenes benchmark gets compiled into assembly language. Here is the source code for the compilers and run-time support routines. XPLPX compiles programs that run in 32-bit protected mode under DOS or versions of Windows that still run DOS programs. Since it's an optimizing compiler that requires a math coprocessor, floating-point operations are about ten times faster than with 16-bit XPL0. This, along with its built-in hi-res VESA graphics, makes it ideal for writing animated graphic demos and games. It uses the PMODE DOS extender (thanks Tran!). A familiarity with 16-bit XPL0 is assumed. Even if you're not into programming, you might enjoy running some of these games. They're all written in XPL0, and they all include the source code. They make good examples for the more advanced programmer. TeXtris is a cross between Tetris and Scrabble. The idea is to form words from falling letter tiles. Crammed into the small exe file are the 53,800 official Scrabble words between 3 and 7 letters long. Not only is the source code included, but all the utilities that went into making this game (so, for instance, you can easily make the French version). Download TEXTRIS.ZIP (276k, 25-Jul-2011). Challenge Matey to a game of chess - or play against another person with Matey enforcing the rules. Move pieces with the mouse, specify skill level, undo bad moves, view Matey's thinking. This is more of an XPL0 programming example rather than a strong competitor. It rates about 1100 at its level 4 (blitz). Included in the source code is a Tic-Tac-Toe program that provides a simple example of recursive tree search. Download MATEY.ZIP (56k, 25-Jul-2011). Test your skill at solving peg solitaire. The challenge is to jump over each peg (or man, like in checkers) and see how many you can clear from the board. You win when there is a single peg left in the center. Included is a simple version of the program and a deluxe version by Ed DeWan, shown here. If the deluxe version is run under WinXP, it must be started from a DOS prompt in full-screen mode (for some strange reason). Download SOLO.ZIP (67k, 25-Jul-2011). Thirty years ago Space Invaders took over the world. Here are two versions of that historic game, one in QBASIC by James Eibisch and a translation in XPL0. Both are faithful copies of the original Taito version. You may have a problem getting the sound to work. That's because the Sound Blaster's FM registers are used, and these have been phased out on modern machines. Download INVADERS.ZIP (74k, 25-Jul-2011). Yer basic shooter...with source of course. Have fun! by directly controlling the Sound Blaster registers. Similar to but different than Windows Solitaire. 386+, 800x600 SVGA and mouse required. it's started at a DOS command prompt in full-screen mode. or diagonal rows from falling icons. 286+ and 640x480 VGA required. 286+, 640x480 VGA and mouse required. Looks better on a CRT monitor than on an LCD monitor. Arcade version of classic Star Trek game. 16-color animation with scrolling background. Hi-res graphic images in text mode. Hi-fi sound from the PC's one-bit speaker. 286+ and MDA (or VGA) required. Runs under DOSBox 0.74, and with sound! Solve it yourself or watch the computer do it. 286+ and 640x480 VGA required, mouse optional. Describes tricks for doing high-speed graphics. Now it's your turn. Here's a simple program to launch your career as a computer game programmer! The complete code is only 4.5 pages long. Match pairs of cards by clicking on them with the mouse. The code is purposely kept simple. You might want to convert the text images to stunning graphics (see 8Across). You might want to add a timer to see how fast you can match all the cards. Download CONGAME.ZIP (8.5k, 25-Jul-2011). Computers with nVidia displays running Windows XP do not set the video sweep rates properly for resolutions greater than 640x480. The result is either a blank or torn-up screen. Here's a patch made by Martin Sulak that solved the problem for me. Download VideoPrt.zip (13k, 17-Feb-2005). Thank you Martin! These animation players are courtesy of Mihai Ionascu of Romania. One runs FLI files and the other ANI files. They both use 32-bit XPL0. 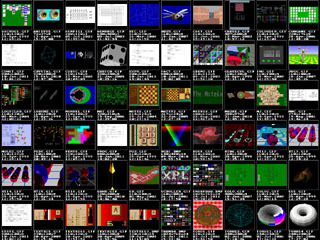 Lots of FLI files can be downloaded from here: http://cd.textfiles.com/maxx/tothemaxss/FLI/, and the FLI format is explained here: http://www.fileformat.info/format/fli/egff.htm. The ANI format was originally made for the Amiga computer. Examples and further information are here: http://www.randelshofer.ch/animations/. Watch the bee buzz and Juggette do her thing! Download ANIMPLAY.ZIP (146k, 25-Jul-2011). "See" is an image file viewer that supports these formats: BMP, PCX, LBM, BBM, IFF and GIF. 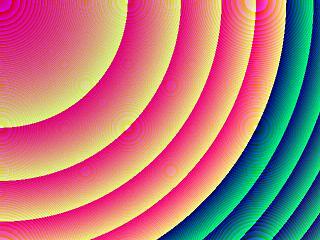 It handles images up to 1280x1024 in 24-bit color and displays GIF animation (like shown here). It uses a file navigator similar to the Open dialog box in Windows. Well-commented source code is included so you can add the formats you want. Download SEE.ZIP (36k, 25-Jul-2011). Snarf is a TSR program that takes snapshots of virtually any DOS graphic or text screen. It's particularly useful under Windows XP, which will not capture DOS graphic screens. Although Snarf is not an XPL0 program, it's so useful it had to be made available somewhere. It's 100% assembly code, and the source (of course) is included. Download Snarf15.zip (31k, 25-May-2007). Simulate basic logic circuits. Quickly "wire-up" gates and flip-flops. Connect them to push buttons or clock generators, and watch 'em run. Red and green signal lines show the logic levels (0 or 1). A group of gates can be selected then dragged, duplicated, deleted, or deMorganized. Windows-like GUI runs under DOS, Win3.1, 95, 98, and XP (even with nVidia), but not WinNT nor 2000. Source code included. Download LOGICLAB.ZIP (69k, 25-Jul-2011). Sort files by name, extension, date, or size. Discover how clusters waste your disk space! Customizer program and XPL0 source code. mode on an HP LaserJet or Inkjet printer. Pages are 80 characters by 60 lines. Lines longer than 80 characters are wrapped. QPR prints four pages in two columns in portrait mode. Some utility programs to make DOS text files more compatible. EatEOF removes the final end-of-file character. Tab2Sp converts tab characters to equivalent spaces. The source code shows a nice way to handle file I/O. Here's Boreal's Cubic demo, complete with source (which is required to even run this self-referential program). It utilizes 640x480 graphics in 256 colors and runs on a 500 MHz (or faster) processor. The Caps Lock key pops up a window showing the CPU usage. Download CUBIC.ZIP (39k, 25-Jul-2011). Here's a selection of maze programs from simple to complex - rectangular, hexagonal, and spherical - 2D and 3D - inside and out. Perhaps one of these eight programs will strike your fancy. Download MAZEMAD.ZIP (130k, 10-Jun-2012). you can now witness this historic event in your very own home! Here's a simple version of a raycaster like used in Wolfenstein 3-D. The essentials are boiled down to seven pages of commented code. Use your mouse to move through the rooms. Could this be the start of your FPS game? Fit the 12 pentomino pieces into the box. Programs like Pents stop running after a few seconds under Windows XP unless the Idle Sensitivity lever is set all the way to the Low position. This setting is buried in a Shortcut under Properties -> Misc. the physicist's world into chaos. Stereo 3D plot of the Lorenz Attractor. "Can the flap of a butterfly's wing stir up a tornado...?" 72 Lines of XPL0 code. Discuss your most intimate problems with the doctor. Classic example of artificial intelligence run amok. 3-Jul-2006: A recipe for turning a torus into a donut: Real-Time 3D Rendering in XPL0. 4-Aug-2005: XPL0 Runs on Homebrew Machine: John Doran, a member of our local computer club (the 6502 Group), designed and built a computer based on 7400-series TTL. How it came to run XPL0 is described here. 3-Oct-2001: The complete source code for the Apex operating system that runs on the Amiga A1000 and A2000 computers is available here: APEX-SRC.ZIP (339k). Apex is roughly similar to Amiga's CLI (Command Line Interpreter) and MS-DOS. In addition to the Apex kernel, there is source for an XPL0 compiler, 68000 assembler, debugger, text editor, and numerous utilities. The code is released "as is." It will take some effort to sort it out. I'll improve the documentation if interest warrants. Start with README.TXT. Executable images of bootable diskettes are here: APEX-BIN.ZIP (207k). You will need to devise a way to copy these images onto an Amiga floppy (starting at the very beginning: track 0, sector 1). A1000.BIN boots in place of KickStart and occupies the KickStart RAM. A2000.BIN boots in place of AmigaDOS and requires a 68020 chip. 28-Jul-2001: If you've been looking for the version of XPL0 that runs on Parallax SX (formerly Ubicom, formerly Scenix) microcontrollers, it's here: Download SXPL.ZIP (131k). Lenny Boreal releases his text scroller. graphics" is a mere two pages of code! * Unfortunately Microsoft seems determined to exterminate DOS programs because each successive version of Windows does a poorer and poorer job of supporting them. Windows 98 had the ability to restart in MS-DOS mode. Windows XP went to "heroic lengths" to support DOS applications, but it still introduced many incompatibilities. Windows Vista and Win7 won't run any kind of DOS graphics program, not just XPL0's. Instead, they pop up the message "This system does not support fullscreen mode." Nothing in the Compatibility mode settings solves the problem. Win7 64-bit is the final straw. It won't even run a one-byte program (RET) that has worked on everything prior - so much for "upward compatibility." DOSBox and virtual machines (such as VMWare or Virtual PC) do provide a partial solution, but they run programs slowly and convulsively, and are certainly not as convenient as simply booting good-old-fashioned DOS (which works fine on 64-bit CPUs). If you're dismayed by all the problems created by Windows, it might be helpful to remember what W.I.N.D.O.W.S. stands for: Windows Is Not DOS - Only Works Sometimes. This site is maintained by Loren Blaney. He'd very much enjoy hearing from someone other than spammers for a change. If you have any feedback, programs you'd like to see, or especially bug reports, please send him a note at: loren (dot) blaney (at) gmail (dot) com. Thanks!